We’ve recently released Office 365 Threat Intelligence, a solution that leverages the billions of signals that Microsoft receives about threats to Office 365 as well as other cloud & software solutions to proactively notify Office 365 administrators of threats & attacks that may impact them. It also provides visuals that help Office 365 administrators understand what threats are most relevant to them – specific to their Office 365 environment & identify where in their tenant, there may be a potential risk. Lastly, it provides detailed dossiers on known threats to educate Office 365 administrators as well as proactive prevention & remediation solutions to address threats when they are detected. Office 365 Threat Intelligence is available as a separately subscribed solution or available as part of Office 365 E5. 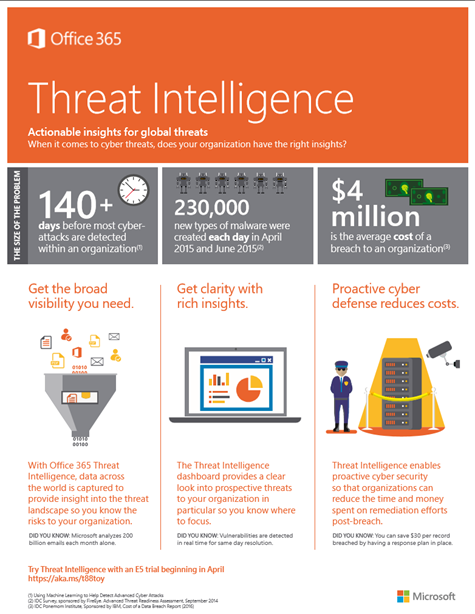 Here’s an infographic that we produced that provides some insight into what value Office 365 Threat Intelligence provides.